Aqua-Hot Heating Systems, the leader in RV hydronic heating solutions, is debuting a new line of heaters at the RVIA National RV Trade Show, Nov. 27–30, Louisville, Kentucky. The ultra-compact 200 Series is perfectly sized for 5th wheels, class C and smaller class A coaches and is featured in the new Entegra Insignia motorhome. Similar to a home or luxury motorhome experience, Aqua-Hot's 200 Series provides gentle currents of even warmth, without the noise and dry, dustiness of a forced air furnace. User-friendly, it's controlled by a simple switch and thermostat. Additionally, it delivers continuous, hot water at a rate of 1.5 gpm for showers, laundry and washing dishes. Fueled by propane or diesel, and operated by 12V with an optional 110V electric element, the 200 Series can be used with up to five heat exchangers providing up to 40,000 Btu/hour of heat and can be adapted to provide in-floor heat. All ports are located on the top of the single unit for easy access and quick, convenient installation. Half the size of Aqua-Hot's 400 series, the compact unit measures a mere 11.69" H x 12.45" W x 21.61" L and weighs 84 lbs. empty. Contact Aqua-Hot Heating Systems, 7501 Miller Dr., Frederick, CO 80504. Toll free: 800-685-4298 or 303-651-5500; Fax: 303-857-9000. marketing@aquahot.com; www.aquahot.com. 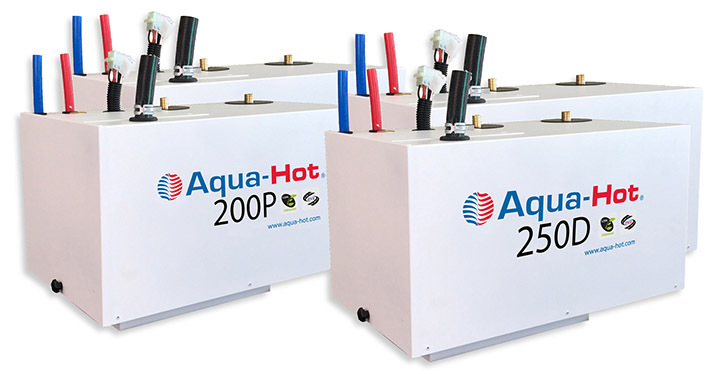 Editor's note: See the innovative 200 Series of hydronic heaters from Aqua-Hot at the RVIA National RV Trade Show, Nov. 27–30, Louisville, KY, booth 40.